Jordan: Jordan has a BS in chemistry and has worked with adhesives and polymer science for the last ten years. His specialties include “green” chemistry, which involves coming up with more environmentally friendly alternatives to existing chemistry or formulations. Jordan is made up of chemicals and likes thinking about them. Gwen: Gwen has a BA in chemistry (it’s complicated): She did conservation research in a museum, helping museums develop better ways to preserve art and prevent fading and damage, before quitting to become a full-time writer. She has an opinionated blog and you can also yell at her on Twitter. Gwen: So what are we talking about this time? Jordan: Writing is thankfully less hazardous. It should go without saying, but don’t try any of this at home. Gwen: You probably already know about the problems with explosions in space. Quick recap: There is no sound in space and fire can’t burn in a vacuum. Jordan: A spaceship could blow up, but the explosion would have to start inside the ship where there is oxygen. Gwen: And without any air to carry it, the shockwave would quickly dissipate. Jordan: That’s another thing: The shockwave from an explosion is usually the most dangerous part. The difference in pressure as it goes by can blow eardrums, cause concussions, and even kill a person outright. Gwen: Grievous bodily injury from shrapnel or from being thrown around and hitting things is the other major cause of death, especially with military-grade weapons like grenades and shells, which are designed to fragment in the way that causes the most injury. Jordan: Explosions are fast. Most of the time, you won’t have a chance to do more than flinch. You certainly can’t outrun one. 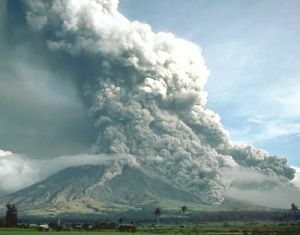 Gwen: A volcanic pyroclastic flow moves at upwards of 400 mph, for instance. Even a light aircraft couldn’t escape that. Jordan: Most modern explosives aren’t actually very volatile, for obvious safety reasons. You can light C4 on fire without making it explode. Gwen: The most lively common explosive is nitroglycerin, which can be set off by dropping it or shaking the container. Jordan: Even gasoline is less flammable than it is in movies. If you toss a lit cigarette into gasoline, it will go out. It’s simply not hot enough. You need an open flame. Gwen: On the other hand, given an optimal fuel/air mixture, all kinds of things can become explosive. Fine dust created in industrial processes is responsible for many accidents. In 2008, a sugar refinery exploded when a spark ignited the sugar dust. 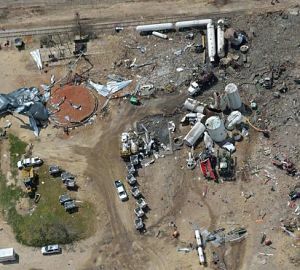 Jordan: And of course the West, Texas explosion last year was caused by stored fertilizer. Substances like that are especially dangerous, since chemically they contain oxygen, which is required for combustion. Basically, it’s a self-contained system. Gwen: Our relatives in Texas keep telling us what great chemistry job opportunities there are out there. It just doesn’t seem worth it. Jordan: I mentioned oxygen. Everybody knows the triangle of combustion: Fuel, heat, and oxygen. But the trick is that, depending on what’s burning, the oxygen doesn’t always have to come from air. Gwen: In some situations, it can come from carbon dioxide or even from water. Magnesium burns this way, which makes it very hard to extinguish. It’s used in incendiary bombs. Jordan: You probably don’t think of metals as being flammable, but magnesium is easy to light and it burns very hot. It burns a bright white color. Gwen: The worst accident in the history of motorsport, the 1955 Le Mans disaster, involved a car with magnesium alloy parts. It caught fire and rescue workers attempted to put the fire out with water, which only intensified the fire. The car burned for hours. Jordan: Metals often burn in dramatic ways. Strontium compounds burn with a nice red color. They’re used in road flares. Fireworks use other metals to create blue, green, and other colors. 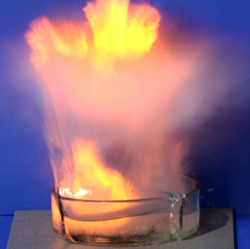 Gwen: Sodium is another exciting one: It can catch on fire when it comes in contact with water. Potassium and cesium are even more dramatic. 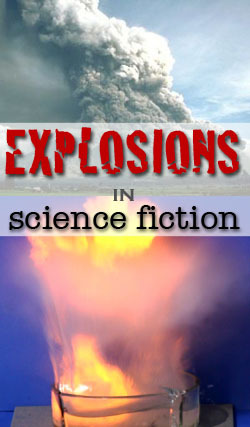 Jordan: Explosions are fun, but books and movies often neglect less flashy effects of heat and being near hot things. Gwen: Right–they tend to treat hot things like they can’t hurt you unless you actually touch them. But ambient heat can be a serious danger. For instance, when Obi-Wan and Anakin are fighting on platforms a few feet above a giant lake of molten lava in Star Wars Episode 3, they ought get heat exhaustion, even if the poisonous fumes from the volcano didn’t take them out first. Jordan: People can walk on lava flows in Hawaii because it has already cooled and crusted over. Most of the heat is trapped on the inside. Gwen: Speaking of lava flows, you can’t sink into lava. It’s a liquid, but it’s still as dense as rock. If you fell into lava, you’d float on top of it. Same with molten metal. Jordan: Metallurgy is its own topic that we’re not going to address in detail. Gwen: Alas, it’s outside our area of expertise. But we do encourage you to read up on it if you’re writing about ancient weaponry. The capabilities of steel weapons versus iron versus bronze vary greatly. Jordan: We can touch on a couple of points. First, there’s corrosion. Most metals quickly rust without proper care, so you won’t find a thousand-year-old sword with a blade that can still cut. Not even if there’s a prophecy about it. Jordan: Aluminum is the big exception. When aluminum begins to corrode, the aluminum oxide forms a protective layer that prevents it from corroding further. Gwen: Bronze can also form a pretty patina instead of corroding if conditions are right. And, of course, gold. Jordan: But you won’t find ancient artifacts made of aluminum anyway, since the refinement of bauxite was only invented in the late 19th century. Gwen: Conversely, metals require oxygen to rust, so a spaceship or space station that never enters the atmosphere shouldn’t look rusty and discolored, no matter how old it is. Jordan: Well, that’s all we’ve got for today. Gwen: We hope this will help the next time your characters need to blow something up, light something on fire, or otherwise create mayhem.